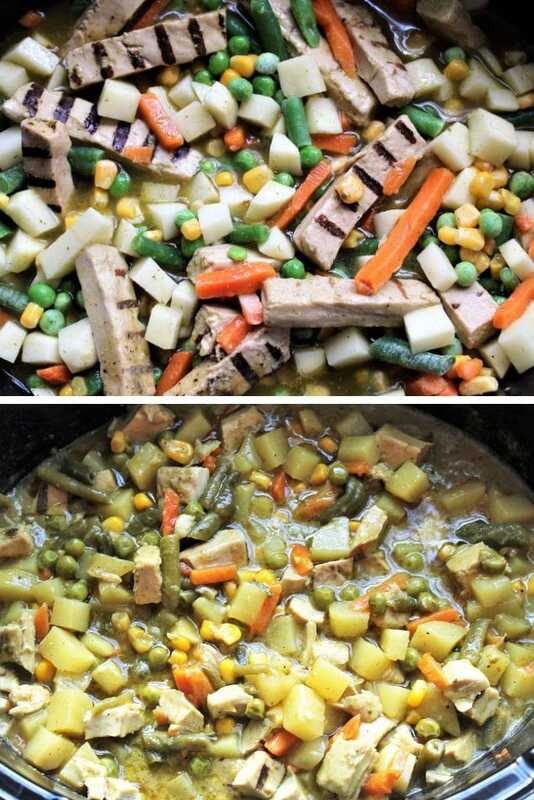 You are here: Home / Dinner / Quick and Easy / Vegan Chicken Pot Pie – In the Crock Pot! 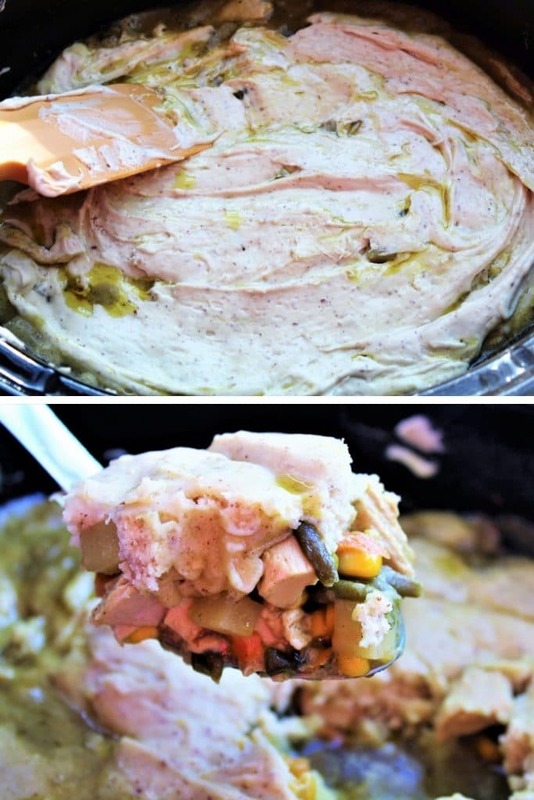 This vegan chicken pot pie is so easy to make in your crock pot, you won’t believe it! It’s vegan, gluten free, and can be made soy free too so everyone can enjoy this ultimate comfort food! Just dump in all the ingredients, walk away, and let your slow cooker do the magic! Return an hour before you want to eat and top the filling with your pie crust of choice. There is no fussing with dinner during the rushed part of the day. Everyone loves it, especially kids! Since it’s vegan, gluten free, and soy free, nearly anyone can eat it. Chicken pot pie is total comfort food! Sometimes you crave those hearty meals from your childhood. For me, this is one of those meals that I just had to veganize! What do you use for the “chicken” in a vegan chicken pot pie? You can use any of the chicken strip substitutes for this recipe. The ones from Gardein or Beyond Meat work great. (Make sure to check the ingredients, some types are not gluten free). I also like to use Butler soy curls in this recipe. They have a nice flavor and texture and they are gluten free (but not soy free). Note: If you don’t want to use any meat substitute, you can use a can of drained chickpea instead. How can you make a pot pie in the crock pot? Surprisingly, pot pies come out great in the crock pot. It’s one of those dishes that you want the veggies to cook down and get infused with the flavor of the gravy, so the slow cooker works perfectly! Simply dump in veggies, potatoes, and the “chicken” replacement of your choice. Then add a mixture of broth and seasonings for the “gravy.” Give everything a stir and set your crock pot to high. About 3 hours later, and hour before you are ready to eat, give it a good stir and cut the pieces of “chicken” strips small if needed. Then, top the veggies with your favorite pie crust recipe, store bought puff pastry, or my gluten free biscuit recipe. Put the lid back on top and keep the crock pot set to high for another hour to cook the pie crust. After hour, the crust will cook beautifully and you will have a pot pie ready to eat! How do you make the vegan chicken pot pie gluten free as well? If you need your pot pie to be gluten free, simply make a biscuit like batter to put on top of the veggie filling instead of a pie crust. How long does a pot pie need to cook in the crockpot? It can be done in as fast as 4 hours when you set your slow cooker to high. If you want it to cook longer: Set it to low for 5 hours, and then turn it to high after you add the pie crust and let it cook on high for only the last hour. This will equal a total of 6 hours of cooking time. Do you love savory vegan “chicken” recipes? Try this delicious vegan chicken noodle soup! It tastes like the real deal, yet with no animal products! Did you make this pot pie? Leave a comment and rating and let us know what you think! This gluten free and vegan pot pie is made easy in the crock pot! Total vegan comfort food! Peel and dice potatoes into bite sized cubes. (While you are cutting potatoes boil 2 cups of water for the gravy). 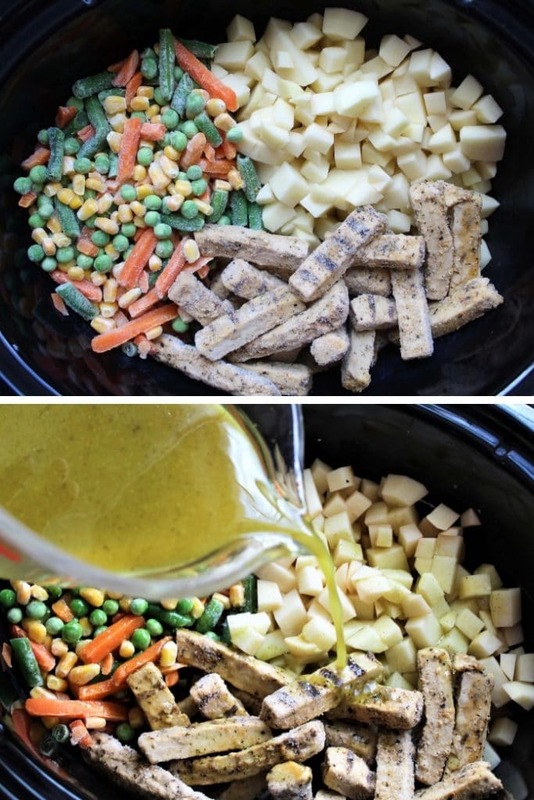 Dump veggies, cubed potatoes, and a package of vegan "chicken" into your crock pot. (If using Butler soy curls, add them dry and add an extra cup of water and 1 extra broth cube to your gravy mixture. Make the gravy by combining all of the ingredients listed in the above gravy section and pour over the veggies and "chicken." Give it all a stir and turn on crock pot to the high setting. Mix the cornstarch and cold water and pour into the crock pot and give everything another stir. Put the lid on and come back about 4 hour later (1 hour before you want to eat). Put in flax and water mix, water, and oil. Mix on low for a few seconds until it forms a biscuit like dough. (Add another teaspoon or 2 of water if you think that it will be too thick to spread onto your pot pie). Spread the biscuit dough evenly on the top of the veggie mixture. Then cover and let cook on high for another hour. Come back in an hour and it will be done! If you don't need this to be gluten free, you can use your favorite pie crust recipe or pastry puff sheet to top the pot pie. If making your own pie crust, use the lid of the crock pot to cut out the correct size and shape to top your pot pie. Before adding the topping, cut pieces of "chicken" strips into smaller pieces if desired. You will need a crock pot that is 6 quarts or larger. This is so cool! Why did I never think of it? I’m the only vegan in the house so I’m parting it out to me sized servings and storing it in the fridge. I could iand will) eat thus 3 x @ day till it’s gone. Yum!!! My whole family loved this! Thanks for the recipe! You’re welcome! So glad that your family like it! It is one of our favorites for sure!